We manufacture small and large Railway OHE structures. We are approved by CORE. ZPMC entered the railway steel structure market with a strong advantage in steel structure fabrication, expanding to a new area alongside ZPMC steel structure bridge, wind farm and steel structure factory. We offer a wide range of railway Structures that are fabricated using superior quality are material that are highly durable and have been designed as per the requirements of our esteemed clients. These parts are long lasting and are cost effective solutions for railway industry. We are pioneered in providing the best and ready to install products for railway wagon makers. We are offering Railway Diesel Loco Structure. This structure is manufacture using high grade raw material and are designed as per industry standard and norms.This Railway Diesel Loco Structure is highly admired by our clients and are available in the market at industry leading price. 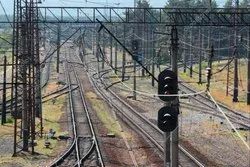 We manufacture railways structures, steel railways structures, galvanized steel railways structures, precision steel railways structures and galvanized mild steel railways structures for domestic as well as export markets. We provide Dual Axis Adjustable Aluminium Rail Structures, which supports for mounting Solar Panel in an easier way. Aluminium has a good property against corrosion and thats why it is strongly recommended for Solar PV application. We are dedicatedly engrossed in manufacturing a wide range of Railway Electrification Structure. 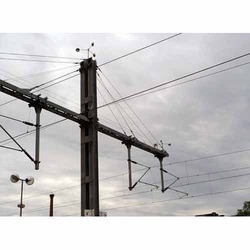 Being one of the trusted firms in the industry, we are highly engaged in providing a unique range of Railway Substation Structure.